To create a culturally-sensitive health service at Forbes and Parkes Hospitals, so Aboriginal people feel welcome, make better use of local services and improve their health outcomes. Improves engagement with the Aboriginal community and develops long-term partnerships between local health services and Aboriginal people. Empowers Aboriginal people to manage their own health and wellbeing. Creates a culturally-sensitive health service that acknowledges Lachlan Health Service is in Wiradjuri country, respects the strong Wiradjuri heritage and is welcoming to Aboriginal people. Encourages staff, patients and visitors to appreciate and respect Aboriginal people and their heritage. Improves patient satisfaction among Aboriginal people and increases their willingness to use local health services. The $113.7 million Lachlan Health Service Project began in 2012 and included the refurbishment of Forbes Hospital and the construction of a new Parkes Hospital. 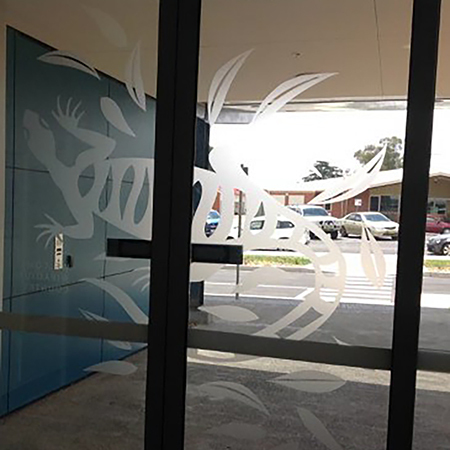 It provided an opportunity for Lachlan Health Service to engage the local Aboriginal community, ensuring the new designs were inclusive and welcoming to Aboriginal people. During the design planning process in 2013-14, feedback from staff and the community highlighted concerns that the design, layout and history of the old hospital facilities at Forbes and Parkes discouraged Aboriginal people from attending and did not support efforts to improve Aboriginal health outcomes. 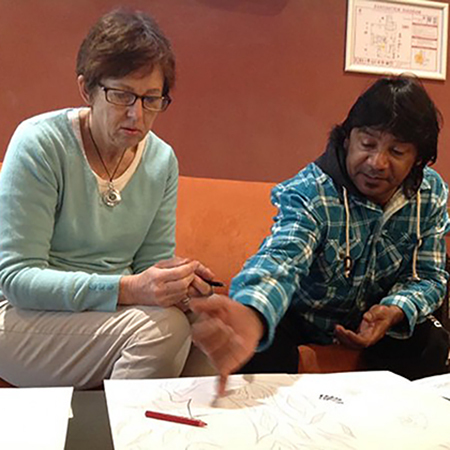 Meetings with Aboriginal people in the community supported these concerns. In July 2014, it was determined that establishing a Culture and Arts Working Party would help change the perception of health facilities in Forbes and Parkes and close the Aboriginal health gap. The Lachlan Health Service Culture and Arts Working Party was formed in July 2014, to integrate culture and arts into the new hospital facilities. Design research conducted by the Working Party in October and November 2014 indicated that bright, open spaces and clear signage would make the facilities more welcoming to all. It was also decided that embedding Wiradjuri graphics and language in the design would reinforce the health services’ appreciation and respect for local Aboriginal communities and increase engagement with Aboriginal people, which would lead to improved health outcomes. Narrabri Hospital’s Aboriginal signage was viewed as an example of signage in hospitals. Arts OutWest coordinated the project, contributing expertise in Art and Health. Arts OutWest was the liaison between artist, designer and the Lachlan Health Service Working Group. Following consultation with Aboriginal communities in Forbes and Parkes, the Wiradjuri gugaa (goanna) was selected as the most appropriate symbol for both hospitals. 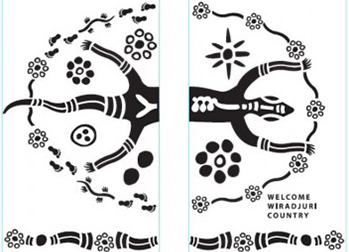 Wiradjuri artists in Forbes and Parkes were contracted to design a gugaa totem that connects people who belong to the Wiradjuri nation, which was featured on the main entry doors. Bright and colourful directional and departmental signage was developed using Wiradjuri words, with an English translation that acknowledges Wiradjuri is a living language. All Wiradjuri language was approved by Dr Stan Grant AM, author of the Wiradjuri language dictionary. Outside areas including birthing courtyards, gathering spaces and the use of native plants in landscaping were incorporated into the redevelopment project, to ensure a positive Aboriginal patient and family experience. 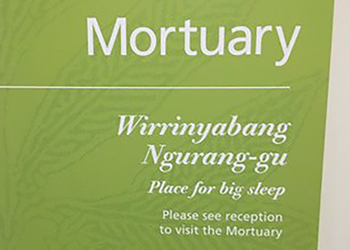 A voice recording of the Wiradjuri words used in the signage was recorded to help staff become familiar with the language. Lachlan Health Councillors and Wiradjuri Elders in the community obtained regular feedback from Aboriginal people attending Aboriginal Working Party meetings in both Forbes and Parkes, from September 2015. Casual reports were often followed up with individual meetings. Feedback was and continues to be overwhelmingly positive. 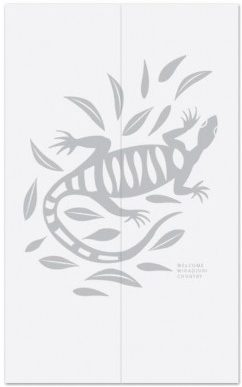 Aboriginal people reported that the Wiradjuri signage and gugaa totem on the entry doors created a welcoming atmosphere, with the following stories collected as part of the evaluation. An older Wiradjuri man who had not accessed healthcare services for many years felt confident going to the emergency department and receiving treatment due to the welcome from the gugaa. 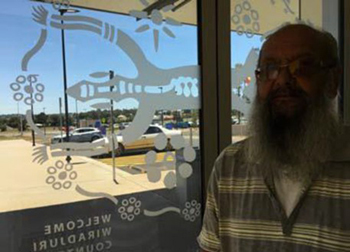 A Wiradjuri man felt safe staying in hospital as an inpatient because of the gugaa and the Wiradjuri signage. A young Aboriginal woman reported that she cried with joy when she saw the gugaa and Wiradjuri language at Parkes Hospital. Comments from participants of the Indigenous Exercise Group were also encouraging, such as: “Love coming to the new building – light, bright and welcoming” and “I think the signage is good, makes us feel welcome.” A number have said: "It shows that Wiradjuri is a living language." Social media coverage of the project was shared widely throughout the local Aboriginal community. In May 2016, the WNSWLHD Board determined that it would be beneficial to have Aboriginal signage in all facilities within WNSWLHD and in all new facilities under development by NSW Health Infrastructure. The WNSWLHD Aboriginal Signage and Artwork Strategy was launched at Parkes Hospital in March 2017 and will be rolled out across 36 facilities by the end of 2019. There is great value in partnering with the Aboriginal community, as well as listening to and engaging with diverse groups in the planning process. It’s important that any Aboriginal culture and language used is approved by local Elders and acknowledged by Aboriginal language authorities. Aboriginal people will work with health services and assume responsibility for their health outcomes if they are respected and feel their culture is valued. The time taken to start and maintain the process, as well as embed the project into the culture of the health service, was challenging. A generic approach is not effective. Each hospital needs to consult with its local Aboriginal community when implementing the project. Arts OutWest. Bathurst: Arts OutWest; 21 February 2017. Arts & health: Wiradjuri signage program expands. Dwyer J, Wilson G, Silburn K. National Strategies for Improving Indigenous Health and Health Care. Aboriginal and Torres Strait Islander Primary Health Care Review: Consultant Report No 1. Canberra: Commonwealth of Australia; 2004. Grant S, Rudder J. A new Wiradjuri dictionary. O’Connor, ACT: Restoration House; 2010. Jackson LR, Ward JE. Aboriginal Health: Why Is Reconciliation Necessary? Medical Journal of Australia 1999; 170: 437-441. 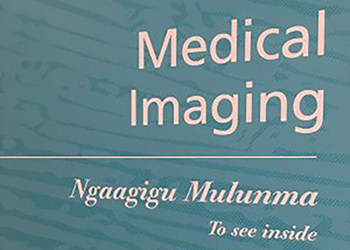 McBain‐Rigg KE, Veitch C. Cultural Barriers to Health Care for Aboriginal and Torres Strait Islanders in Mount Isa. Australian Journal of Rural Health 2011; 19(2): 70-74.